About a month ago, I put out a request to friends and family for a good book. But I didn't just want a good book, I specifically wanted an epic, heart-wrenching, take-me-away story. I just needed something to swallow me whole and I didn't care how much it would hurt. Have you ever just needed that? Well, after some recommendations and research, I found The Bronze Horseman. And it totally fit the bill. First of all, this book is a monster. It's like 700 pages. It begins at the start of WWII and the invasion of the Russia, the same day that the young and naive, Tatiana, meets the mysterious and brooding soldier, Alexander. The book follows them through the transition from daily life in Leningrad to the devastation of war and starvation, losing everyone you love and feeling imprisoned by communism. Beneath all of that was the most torturous romantic tension I have ever read. This book taught me that good writing and strong characters trump everything else. The plot was drawn out and a bit misshapen. There was more than one story arc meaning that the book could have ended in many different spot. Did I care? Heck no. In fact, I think it made it better. Life doesn't happen in escalating drama/climax/resolution. It happens in moments, big and small, drawn together through experience and relationships. The love story in this novel is built, carefully and patiently. They don't love each other on day one, but the connection is there, so by page 600, it is epic and all-consuming. The payoff is huge and totally worth the wait. Tatiana and Alexander are two of the most well-developed characters I've come across, at least in a romance novel. They reminded me a lot of Claire and Jamie of Outlander, and not so much in behavior, but just in how realistic and consistent they are. In romance stories, it's easy to make your characters perfect and "easy to love" and it's usually the reason I can't read Romance novels. However, these characters are so flawed and real. Tatiana is naive and foolish. Alexander is bull-headed and short-tempered. But they are real, and I think it makes the love between them so much stronger. As a writer reading this book, I admired the way Simons really pulled me in. She brings out all of the detail without boring you. She has a way of describing the emotional landscape that I can't even get my head around. Her writing is just exquisite. 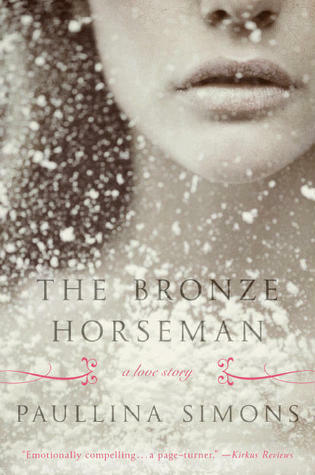 The Bronze Horseman has two sequels. I did not know this when I turned the last page as I cried my eyes out. If that had been a stand alone novel, that ending still would have been brilliantly beautiful. But I'm sure glad it wasn't. I'm about 20% into the sequel and so far, I'm not feeling as drawn in as I was with the first, but that's okay. As long as I have Tatiana and Alexander, I'm happy. These characters will be in my heart forever. Clear your schedule. Get comfy and ready this book. Oh wow. I *must* read this book asap. I love long novels that take you on a journey. 700 pages, plus well-developed, non-cliché characters? SOLD! :) Thanks for sharing! I will have to check this out! By the way, thank you for displaying my book cover on your sidebar. I came here to comment on this post, and I was all, "Hey, that's me!" Ooooo....that sounds like something I would love. I adore historical fiction.